Once upon a time there was a high school senior taking a tour of a liberal arts college in Iowa. This was her second visit to campus. She was pretty sure she wanted to go there in the fall, but this trip was meant to finalize her decision. Since she had already seen the majority of the campus on her previous visit, her tour guide said, "We need to kill some time. Wanna go see my girlfriend's sorority house?" "Ummm, sure," she said, although she considered it a pretty big waste of her time. After all, she was NOT the sorority type. However, when she walked in the door of that house, the delicious smell of brownies wafted to her nose. The cook, a lovely lady by the name of Dana, was baking up a batch of her chocolate diet-killers. "Hey," the girl thought as she chewed on one of those luscious, cake-like brownies. "Any place that has food this good can't be all that bad." And wouldn't you know it. That fall, this young lady joined that very same sorority ... and she got a copy of that recipe! Stir together the first five ingredients in a large bowl. In a small bowl, combine the oil, vanilla, water and vinegar then pour into dry ingredients and stir until blended. Pour batter into an ungreased 9X13 cake pan and bake for 20-30 minutes. Remove from oven and allow to cool. To make the frosting, combine the sugar, margarine and rice milk in a sauce pan and bring to a boil. Boil for one minute, stirring constantly. Remove pan from heat and add the chocolate chips and vanilla. Beat the mixture with an electric beater for a few minutes or until it looks like the frosting will set up. Spread over the cooled brownies. These are so delicious! I'm making my second pan in a week. 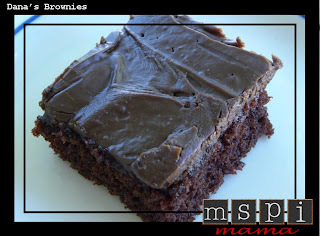 They are more cake-like than brownies, but so good! I'm so glad they don't have eggs, either because my daughter can also not have eggs on top of the MSPI.